If you’re mad about bingo then we at Mobile Bingo Bonuses have a great site for you called Bingo Crazy. Not only is this a fun site to look at with their quirky, crazy characters but you’ll also be greeted with amazing bonuses and games. Their huge choice of high quality games include bingo, casino, scratch cards and slots such as Wild Vegas and Honey Bees. This bingo frenzy is available 24/7 and what makes it even more impressive is the fact that you can play on your mobile. This means that the fun can follow you wherever you go, so those mundane chores, journeys or day to day tasks can now have the added excitement of these amazing games and possibly a jackpot reward. Like or Follow Facebook and Twitter for 100 bingo cards. 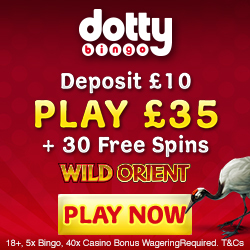 When you register with Bingo Crazy you’ll be delighted to hear that you’ll receive £15 credit, with no deposit required. This credit is a welcome from the site and a great way for you to play around on their pages and games, before parting with anymore of your own money. 3rd deposit, 300% cash match bonus. So for a mere £10 on each deposit you’ll walk away with an extra £90, making a grand total of £120 which is plenty to keep you playing for hours. Even after the welcome bonuses are gone you’ll still receive a cash back bonus dependent on the amount you deposit. So no matter if you win or lose you’ll always receive a little something from Bingo Crazy. For those of you who prefer banking with cash then check out their deposit special page, where like the cash back bonus, depending on the amount you deposit you’ll receive extra credit. 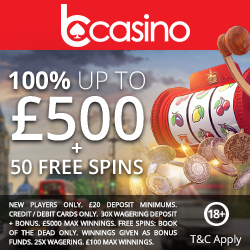 Bingo Crazy have daily, weekly and monthly guaranteed jackpots in their Daily Jackpot Lounge, Mega Jackpot and Super Jackpot bingo rooms where you have a chance to win £250, £500 and £1000 cash. They also believe that the best part of online gaming is meeting fellow roomies, so check out their chat rooms and games where you can win extra exciting prizes. We’re sure you’re eager to tell your friends about this great site and its array of bonuses so why not earn a little something for yourself? For each friend you refer who deposits, you’ll receive a £10 Amazon voucher which you can use on anything you like. So if you have lots of gaming friends then you could earn a lot of extra bonuses. For the social media fans out there make sure you check out Bingo Crazy’s Facebook and Twitter pages so you can keep up to date on the latest games and promotions. Plus if you ‘Like’ or ‘Follow’ either page you’ll receive 100 bingo tickets to use whenever you like. Bingo Crazy accept the usual banking methods including Credit and Debit cards, U Kash, Paysafe Card, Neteller and Boku pay by mobile contract. So if you’re ready for a little madness in your life simply head to Bingo Crazy.